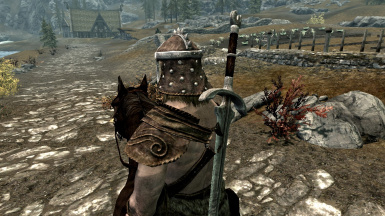 A simple mod to allow you to zoom in closer to your character while riding a horse and also disable the forced perspective change when you draw/sheathe a weapon while riding. Add option in MCM menu to enable/disable. Fixed problem where camera is offset improperly after getting off a horse. Added MCM menu to allow for configuration options. 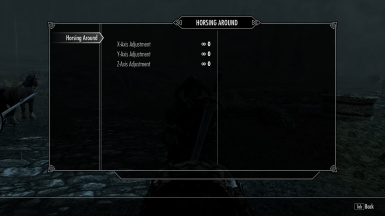 This is a simple mod that will allow you to zoom in closer to your character while riding a horse. It will also disable the forced perspective change that happens when your draw/sheathe your weapon on a horse. There is an MCM menu that will allow you to make some adjustments to the camera position. If you don't use SkyUI or simply don't want to waste a slot in your load order, the SKSE plugin will work on its own using the default settings. Simply uncheck the ESP in your load order to remove the MCM menu from your game and only the SKSE plugin will be used. Skyrim Reloaded - Performs code injection that will interfere with horse riding behavior.